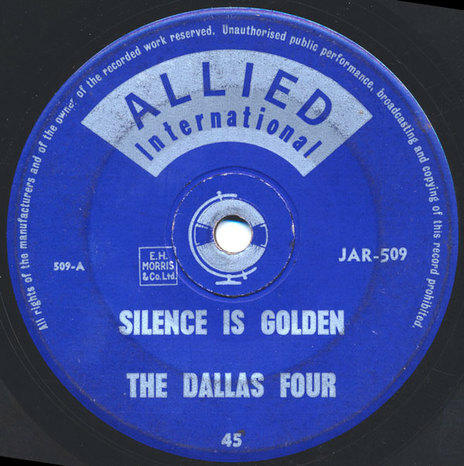 Allied International was originally set up in 1959 as Top Rank Records. The founding partners were Auckland promoter and owner of Prestige Records, Phil Warren (who owned 50%), New Zealand cinema chain and venue owner Kerridge-Odeon, and the massive UK Rank Organisation (who jointly owned 50%). The owners aspired to create a major label in an era when there were few in New Zealand. After six months, having bought out his partner Bruce Henderson, Warren folded his Prestige label (Johnny Devlin) into the group, including all its many licensed offshore labels, although Prestige kept its own identity until 1961. Warner Brothers, one of their most lucrative licensed labels, did not like being distributed by a company named “Top Rank” as Warner Brothers competed against Rank in the UK. This forced a name change to Allied International in early 1960. After some internal disagreements over priorities and his increasing focus on touring artists and clubs, in October 1961 Warren and Kerridge/Top Rank sold the company to G.A. Wooller & Co. Ltd, the record division of Pye (NZ) Limited (the NZ division of the UK Pye company, albeit with minority NZ shareholders George Wooller and T.J. Spencer) and New Zealand distributor of Festival Records and other labels. Warren retained the Johnny Devlin catalogue. Allied International thereafter was part of a combined Wooller controlled Festival/Allied International entity until December 1966 when Festival Records (Pty.) Ltd., the Australian owner of Festival terminated their license and launched a new joint venture Festival Records (NZ) Ltd. with Kerridge Odeon. Ironically, Phil Warren then inked a deal for his newly signed acts with the now stand-alone Festival Records, via his James Productions company (itself a partnership with saxophonist/producer Jimmie Sloggett). Pye (NZ) Ltd. purchased the Radio Corporation Of NZ in 1964, including the license for RCA Records in NZ, and moved their pressing plant from Wakefield Street in Wellington to Paeroa when it operated until 1975. In 1996 the UK Pye operation was acquired by the Dutch Philips company and with it came the majority shareholding in Pye NZ and its subsidiaries including Allied International Ltd., although the local company would remain standalone until 1980. Managed day to day by Fred Noad, Allied International released both offshore and local artists, with important records including The Bluestars (including ‘Social End Product’), The Brew (‘Bengal Tiger’), Hi-Revving Tongues, Four Fours and The Gremlins among the label’s more than 180 single releases. For all that though, the label’s local A&R policy was at best sporadic, with few albums and little in the way of artist development, acts tending to leave for better pastures after a few releases. Allied International Limited also issued local acts on the Pye label from 1967, with both labels overseen by A&R head Fred Noad who remained a key player at the label until the mid-1970s. In the late 1960s and early 1970s, Tim Murdoch and Rhys Walker were also important names. Murdoch left in late 1972 to create WEA NZ whilst both Walker and Noad remained with the company until it shut its record division. The last notable gasp for Allied International as a label brand was in 1970 with the release of the legendary Stoned Guitar album from The Human Instinct on a briefly renamed AIR label – followed a few months later by Wasting Our Time, the second album from The Underdogs – after which the label ceased to exist. However, the Allied International Records Limited company continued as the parent of the Pye label and the new Family Records label (created in 1972 by Tim Murdoch and notable for John Hanlon) until October 1976 when the record division was shut down. The Pye Group in New Zealand was absorbed into the Philips New Zealand combine in 1980. The old Allied International offices at 110 Mount Eden Road in Auckland became the new Auckland home of the Philips owned PolyGram Records who remained there until 1999 when the company was acquired globally by the Universal Music Group. The Pye, Family and Allied International catalogues are now owned by Universal Music.